Written by Peter Conrad My Costa Rica travel vacations continues at the North Pacific in Guanacaste. I’ve been to a lot of Amazing places, like Flamingo, El Coco and Conchal. These beaches are close from each other, and won’t take you long to get to them. I’m now staying at Potrero, 5 minutes from Flamingo, since it is a quieter place, perfect for relaxing. I really enjoyed Flamingo and its vibrant life, but now if you look for a quiet place with nice Costa Rica Resorts, go to Potrero. 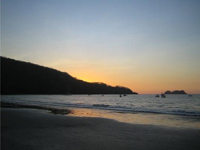 One of the most popular Beaches in Guanacaste is Hermosa Beach. It’s funny that there are two Hermosa Beaches in the Pacific coast of a small country, the other one in Puntarenas, right after Jaco Beach. While the southern Hermosa is perfect for Costa Rica surfing trip, this Hermosa is the spot to relax a get away from the city environment. Just like most of the beaches in Guanacaste, Hermosa has pristine blue waters, but it is a laid back place, not crowded. It has the Blue Flag prize, given to the beaches that have a high level of environmental standards. You can enjoy the sun, walk, or practice scuba diving, snorkeling or swimming. There are all inclusive tours packages offered by Travel Excellence in Hermosa like kayaking, windsurfing, jet skiing, and other water Sports. I went kayaking and it was a great adventure, very relaxing, and I could appreciate the marine wildlife closer. Catamaran rides and fishing are also offered every day. If you rather stay at land, there’s a wide array of activities to do, like horse back riding, biking, and trips to the mangrove swampy. I rented a bicycle and rode around the area, which is easy due to the plain conditions. That is a great activity in your Costa Rica family tour, since it can be done by almost any person. If you want to stay at Hermosa, there are many Costa Rica Resorts and restaurants, including Costa Rica Hotel Packages, stores and services.